Members of the Sphenophyllales were relatively small plants (probably < 1 m tall) that formed a portion of the understo-rey in many Carboniferous forests. Sphenophyllaleans can be traced from the Devonian into the Triassic, but they are best known from petrified and compressed remains from the Carboniferous. Although the order was widespread in the late Paleozoic, Triassic representatives have only sporadically been documented from a few countries, including Japan (Asama and Naito, 1978; Asama and Oishi, 1980) and Korea (Kim, 1989). As the name of the order suggests, the leaves in this group are wedge-shaped and borne in whorls. Stems are protostelic, and secondary tissues are produced in some members. 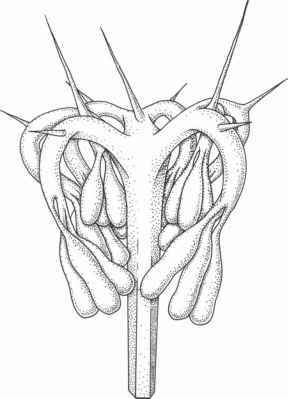 Reproductive parts are aggregated into cones or loosely constructed strobili; all members are apparently homosporous. DEVONIAN SPHENOPHYLLALES The record of Sphenophyllales from the Devonian is sparse. Several interesting fossils are known, however, that have been assigned to the Sphenophyllales, although they do not closely resemble the typical Carboniferous forms. These forms are based on macromorphological or anatomical features and may be significant with regard to resolving early sphenophyte evolution. Four of these fossils Hamatophyton verticillatum, Rotafolia songziensis, Eviostachya hoegii, and the morphogenus Xihuphyllum are given in detail. One of the best-known Devonian plants referred to the Sphenophyllales is Hamatophyton verticillatum from the Famennian (Late Devonian) to late Tournaisian-early Visean (Mississippian) of southern China (Wu and Zhao, 1981; Feng and Ma, 1991; X. Li et al., 1995; D.-M. Wang et al., 2006a). A detailed reassessment of this plant was recently provided by D.-M. Wang et al. (2006a) based on both compressions and partially structurally preserved specimens. Axes of H. verticillatum are pseudomonopodial and possess axial tri-chomes or spines and nodal whorls of sterile leaves, which are dimorphic and sometimes also contain trichomes or spines. Hook-like leaves are up to 15 mm long and 0.7 mm wide and occur in whorls of 6-10 per node, whereas palmate leaves occur in whorls of 6, are up to 40 mm long, and dichotomize two to four times. The axes are protostelic, with primary xylem in a more or less triangular configuration and secondary xylem in radial arrangement. In contrast to other sphenophyllaleans, however, Hamatophyton lacks secondary xylem around the tips of the primary xylem arms (i.e., fascicular secondary xylem). Primary xylem maturation is exarch and the secondary xylem lacks parenchyma and rays. Several specimens showing fertile main axes and lateral branches have been reported. These axes usually lack vegetative leaves but instead bear nodal whorls of stalks up to 2.5 mm long that terminate in a single, elongate to ovoid, spiny sporangium. In some specimens, fertile whorls and vegetative leaves are interspersed. Some of the sporangia contain spherical-triangular trilete spores, 27-37 mm in diameter, with grani and coni in the equatorial and distal region. D.-M. Wang et al. (2006a) regard H. verticillatum as demonstrating the most primitive type of morphology and anatomy known in sphenopsids to date. A plant similar to H. verticillatum is Rotafolia songziensis from the Upper Devonian (Famennian) Xiejingsi Formation, southwestern Hubei Province, China (D.-M. Wang et al., 2005, 2006b). Specimens consist of branched axes, up to 20 cm long, that are characterized by slightly swollen nodes and internodes with ribs and narrow branches produced from the nodes. The axes are protostelic; cross sections show a more or less triangular or quadrangular organization of the primary xylem and radial arrangement of the secondary xylem. Primary xylem maturation is exarch, with protoxy-lem strands positioned around the tips of the primary xylem arms. There is no apparent differentiation between fascicu-lar and interfascicular regions of the secondary xylem, and ray cells are rarely observed (D.-M. Wang et al., 2006b). Protoxylem tracheids have helical wall thickenings, whereas the tracheids of meta- and secondary xylem possess sca-lariform and/or bordered pits. All R. songziensis axes bear trichomes or spines, some up to 2.8 mm long. At the nodes are whorls of six leaves, up to 2.4 cm long, that regularly or irregularly fork two to four times. The leaves are positioned perpendicular to the axis in proximal portions of the plant but inserted at acute angles in distal portions. Fertile branches are produced in a terminal strobilus (8.5 cm long), which is subtended by whorls of normally developed leaves. It consists of a central axis and up to 16 whorls of fertile units, each of which consists of a bract and 6-10 sporangia (D.-M. Wang et al., 2005). The bracts are elongate-cuneate and have prominent marginal fringes; sporangia are attached to the abaxial surface at the base of each bract. Although R. songziensis closely resembles H. verticillatum with regard to external axis morphology, leaf shape, and structure of the primary xylem, the two forms differ in strobilus morphology. Sphenophyllales. The absence of sterile bracts between successive whorls of sporangiophores is a major distinction between E. hoegii and other sphenophyllaleans but parallels the condition in Hamatophyton. Affinities with the Hyeniales have also been suggested based on the organization of the sporangiophores. Xihuphyllum is a morphogenus used for vegetative, puta-tively sphenophyllalean, remains from the Xihu Formation (Upper Devonian) of Zhejiang, China (Q. Chen, 1988). These fossils consist of stout, longitudinally striate, articulated axes (up to 4 cm in diameter in X. megalofolium) with swollen nodes and internodes up to 11.5 cm long. The axes bear whorls of six to eight leaves that are flabellate, ellipsoidal, or elongate-cuneate with coarse parallel venation. Veins occasionally fork and anastomose. The reproductive structures of Xihuphyllum remain unknown.